If you climb the Capuchin Mountain from the Steingasse via the Imbergstiege Staircase instead of the Linzergasse passion walk, you will pass the little church of St. John or "Johanniskirchlein" about two thirds of the way up to the Capuchin Abbey. This little church is among the many hidden but doubtless magical places in Salzburg. Its oldest record dates back to 1319. If you enter the church, you might notice that a painting in the Johanneskirchlein refers to 1478 as the year of erection, but this is false. 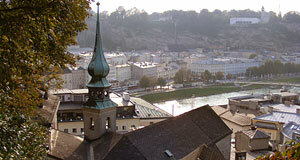 The Johanneskirchlein Church was remodelled under the reign of Prince Archbishop Max Gandolf in 1681. The arch of the main entrance still bears his coat of arms, since the "remodelling" was rather drastic (some sources say "rebuilt"). If Mozart liked it, why shouldn′t you like it, too? The interiors contain altars of marble from 1774, and an altar painting from 1681. The paintings in the side altars were made by Nikolaus Streicher between 1772 and 1774, the sculptures were made by Johann Georg Hitzl. The paintings on the ceiling were made by Andrä Langwieder in 1772. Legend has it that the Johanneskichlein was among the favourite places of little Mozart and his sister Nannerl when they were still children. It is said that the two of them played in the church on several occasions, but doubt about the accuracy of this story is recommended. The Johanneskirchlein was extensively renovated in recent years and turned into the architectural gem Prince Archbishop Max Gandolf wanted it to be. Go into the church but don′t stop for the view - it will be a lot better only some 50 metres further up by the Capuchin Abbey! Nearby is the St. Sebastian Church and cemetery, the Paschinger Schlössl and the Church of the Holy Trinity.